Good news, everyone: After several months of jobhunting, after graduating in September I've found myself a full-time job! I'm thrilled to have started life in the 'real world'... the downside of this, of course, being that I have much less knitting time! 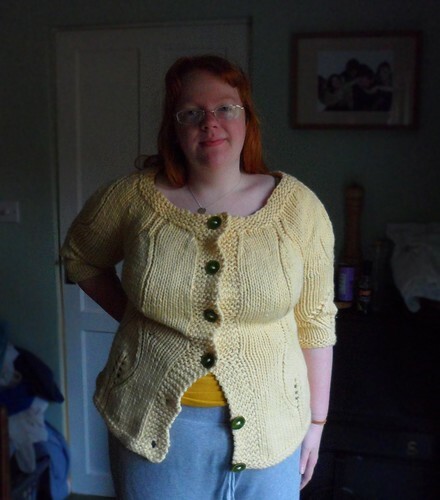 This cardigan was the last big-ticket item I finished before starting work. It's the Modern Garden Cardigan by Veera Valimaki, a brilliant designer better known for her beautiful striped shawl designs such as Stripe Study and Color Affection. Modern Garden Cardigan is a beautiful pattern with an ingenious use of lace leaf motifs for shaping. Unfortunately, the pattern only goes up to 43" bust and my gauge was tighter than the pattern gauge - so I had to do some resizing. 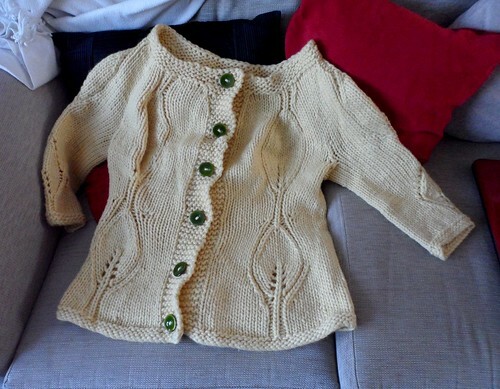 It was great to knit a whole sweater in about two weeks - the bulky yarn made it knit up so quickly, and it's so soft and warm. The yarn is Debbie Bliss Como, a wool and cashmere blend that's soft and lofty. I got the buttons at Unravel, at the Textile Garden booth. I think they add a perfect touch. I 'unvented' two useful techniques in regards to the buttons on this cardigan, which I'll write up in the next few days. The first one relates to spacing the buttons properly, and the second relates to using super-bulky yarn for sewing on buttons. Check back soon! congrats on the new job! So cool! What did you major in and what is your new job? I'm getting ready to graduate in May so any helpful tips are very welcome! Funnily enough my job has no relation whatever to what I studied... I studied Persian-English translation, but the job is in marketing. Actually, the reason my resume stood out to them was because I mentioned my knitting design! The job is in social media & online advertising, so my experience with Twitter, Facebook, and various types of online ads gave me a jumpstart. Advice? Get lucky! Haha. The more places you submit your CV to, the better a chance of getting an interview. Times are tough and it can be difficult to stand out, but don't get discouraged. Of course make sure your cover letter is tailored to the position so you grab their attention. If you're after a job that isn't related to your studies, like I was, don't be afraid to emphasize the skills you've gained in your spare time. Volunteering, blogging, knitting, gardening, whatever, they can all help develop skills that are useful in a job - whether it's organizational skills, people skills, critical thinking, or what-have-you. All my actual job experience what your typical part-time student work, food service and the like, so I didn't have a whole lot of skills from my previous jobs - but I emphasized my writing and marketing skills that came from blogging and promoting my design business.